Samantha Bee, of the Daily Show, was apparently wrong when she said anti-vaxxers tend to be liberals (this is via commenter Scu). They come more from crunchier parts of the country, but they appear to be crunchy-cons as often as crunchy-libs, according to Kevin Drum at Mother Jones. 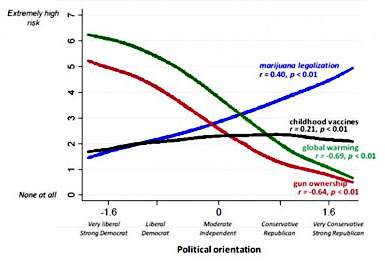 This graph (based on research done by Dan Kahan) shows what people of different political persuasions regard as risky. All find vaccination about equally risky.